While I always enjoy compliments on my cakes and cookies, I've recently begun to get many compliments on may cake and cookie photography. Being a practical and frugal person (interpreted as "cheap"), I'm always looking for creative solutions. After completing my most recent cake, I decided to try something new when it came time to photograph it. I recently installed full spectrum bulbs in the fluorescent ceiling fixture in my kitchen, which has improved my ability to shoot without a flash. Throw in an empty butter tub and a $2.00 scrap of fabric and voila, I've got some really nice photos. 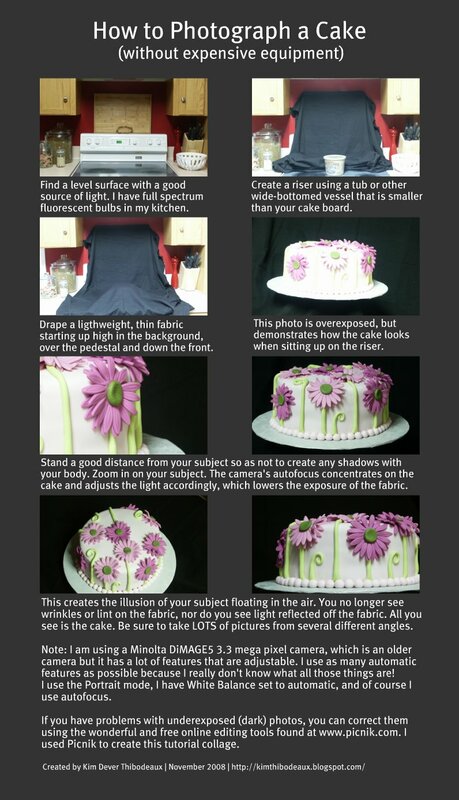 Read more about my Fuchsia Gerbera Daisy Cake. Great job on the cake and pictures! I just happen to land in your website when i searched from Yahoo topics on how to photograph cupcakes. I love how you explained it! Thank you very much. I just bought my DSLR (Canon 500D) a few weeks ago. And like you, i dont know how to navigate on its functions. Im a bit scared actually hehehe. Thanks again for sharing this info. I wish i can learn how to use my dslr soon. Oh, and I love your self portraits from one of your blog entries. Thank you! I have pretty much replaced baking with photography, but I still do a cake every now and then. I checked out your Flickr pics and they were great. Feel free to contact me if you have questions about anything - cake or camera!